It’s at this time of year that, if your windows aren’t up to the task, you’ll start to notice it. This means it is the perfect time to replace your windows and give your business a much needed shot in the arm. Not only will new windows help with thermal efficiency, but they’ll also elevate the look of your business, regardless of whether you’re operating a retail unit or managing a commercial building. So, what are some of the key signs your windows need replacing? This month, we’ll talk you through the different reasons you might need to replace windows before the real cold snap hits. This is one of the most obvious signs that you’ll need to replace your windows (and quickly!) as you will notice the damage on a daily basis. Whether the chips in the glass have started to add up over the years, or the glass has cracked, this could make your premises unsafe. Sometimes damage to glass can happen naturally if it is older, less stable glass, and other times it’s as a result of accidents and vandalism. Do your windows let in a draught of cool air? Perhaps when you stand close to them you can feel the temperature drop? If so, this means that something is wrong with your glass windows. Whether the seal around the windows has deteriorated from poor fitting or the integrity of your double glazing has been compromised, this could be costing you money on heating bills. To reduce your bills in time for winter and increase thermal efficiency in your building, get your windows replaced now. Where your window frames have begun to rust, crack and deteriorate, a quick lick of paint may not help. 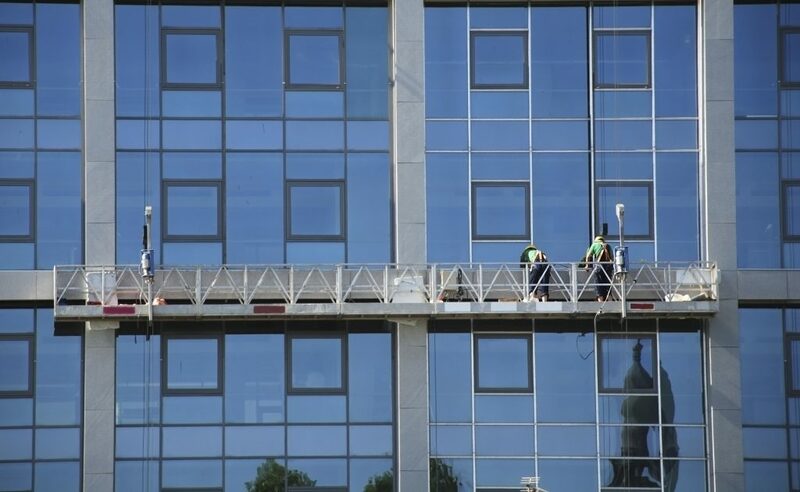 The integrity of your window frames also relates to how safe and secure your glass is – the chances are there will be more problems caused by poorly fitted and maintained frames, something which can impact the health and safety of your building. With new windows, you’ll be able to choose brand new frames to match the aesthetic of your property, as well as increasing performance. Have you recently started to notice that the noise from outside your building – either from the road or footfall of the general public – is getting inside? One of two things could be happening: either the space outside your building is getting busier, or your windows have a performance issue. Whatever the reason is for noticing the noise, it’s never pleasant when you’re trying to work. With the right window replacements, you could cut noise levels down and create a peaceful working atmosphere again. Opening and closing your windows should be smooth, easy and safe for staff to do. If your windows are proving a struggle to deal with, it could mean that internal parts and mechanisms have failed. Not only does this pose a health and safety risk, but it also means you don’t have the basic functionality that windows should have: the ability to open them for fresh air and close them to keep warmth in. Replacing your old windows will make life much easier and present a modern, sleek feel to your building. Are any of the above affecting the windows of your property? Perhaps you have more than one thing on our list which is causing you concern. If so, act now to get your windows replaced and make the most of new fittings in time for the biting cold of winter. At City Glass & Windows Manchester, we have over 40 years of experience in providing window replacements, with a variety of products and specifications available to ensure the integrity and performance of your windows for years to come. Contact us today to see how we can help.